Winmate's latest addition to the Rugged Tablet PC Series powered by Intel's Core2 Duo CPU has received an excellent review from RuggedPCReview.com. 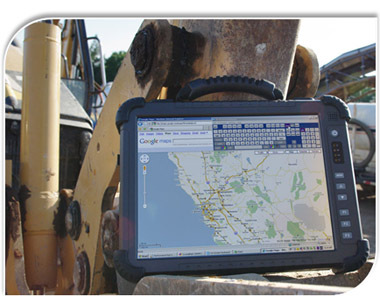 In June 2009, Winmate delivered the latest I880 Rugged Tablet PC to RuggePCreview.com for a 3rd party professional review. The I880 uses Intel Core2 Duo 1.06GHz w/ 945GME chipset which provide the most powerful solution in Rugged Tablet market. RuggedPCreview.com, the professional online magazine for mobile pc applications and products, has reviewed this product in detail. The Core 2 Duo I880 Series is available with either a 10.4 or a 12.1-inch screen, both in a 12.6 x 9.5 x 2.2 inch body, including protective bumpers. Our 12.1-inch test I880 weighed 5.8 pounds. The case - aluminum-magnesium alloy bottom, plastic top - is very solid and well executed, and there is extra protection in the form of large rubber bumpers. The I880 is sealed to IP54 specifications. Winmate has a history of offering various processor architectures and options. The rugged Tablet PC platform is available with low power VIA and Intel Celeron M chips, and now also with the very popular Intel Atom processors. The Core 2 Duo U7500 CPU in the Rugged Tablet I880 is running at a clock speed of 1.06GHz. This chip, in conjunction with its complementing Intel 945 GME and ICH7 chipset, is a power-efficient solution for applications that do require advanced computing performance. Despite the powerful processor, the I880 does not need a fan (it does heat up, though). The 12.1-inch version of the Winmate Tablet PC is perfect for applications that require more screen real estate and benefit from the higher XGA (1024 x 768 pixel) resolution. The display in our review unit was well readable outdoors and its antiglare properties eliminated almost all reflections. The resistive touch screen is very responsive and highly configurable. An electromagnetic digitizer is not available. Onboard connectivity consists of three USB 2.0 ports, RS232 serial, audio in and out, RJ45 LAN, and a docking connector. An optional multi-function dock has four more USB ports, analog video, LAN and a charger for a second battery. The I880 has an externally accessible PCI Express 34 slot that can be used for expansion or for GPS or wide area wireless radio communication options. All ports are sealed with attached protective rubber plugs. Our review unit ran Windows XP Embedded on a 80GB 5400rpm SATA disk and 512MB of RAM. We were surprised to see how quick and responsive XP Embedded ran on just 512MB. While facing well-established competition in the industrial tablet market, the Intel Core 2 Duo-based Winmate I880 offers a clean and highly configurable rugged tablet computing platform that is well suited for a wide variety of challenging jobs in field service, law enforcement, fire/emergency, transportation & distribution, construction, utility and energy, warehousing, patient information, and retail. For full content, please refer to the link of RuggedPC Review. 8.4inch I980 Atom Z530 Series. 10.4 inch V280 VIA VX700 Series. 8.4 inch IA80 Intel Atom N270 Series.